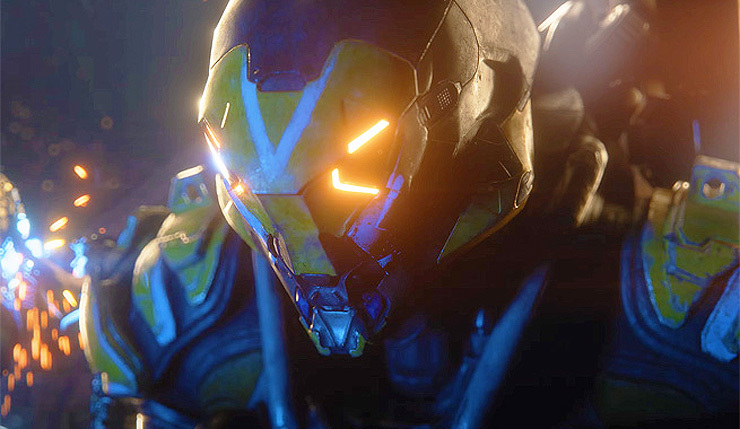 Last year, EA and BioWare wowed us with a first look at their new open-world online RPG, Anthem, but fans were left wanting more. Thankfully, we got more at this year’s EA Play Live Press Conference, including a deeper look at the game’s story and gorgeous world, and details about the game’s shared-world multiplayer. We also got a release date! But first, check out the new E3 2018 Anthem trailer, below. “The premise of Anthem, is a world left unfinished by the gods. But the gods left behind their massive tools, and those tools are in constant conflict with this unknowable force called the Anthem of Creation. And the chaos of those things pushing against other means the world is constantly being reshaped in new and unpredictable ways. We’ve tried to build a solution [for combining co-op and single-player] in Anthem. It’s what we call ‘our world, my story.’ So, when you’re out in the open world […] this is where other players get to play with you. This is a living shared world. Whether there’s unique weather, or it’s nighttime, what you’re experiencing, you’re experiencing together. Everyone playing Anthem is seeing the same thing. This is what we mean when we say, ‘our world.’ It’s a shared world we all experience together. Finally, we got a look at the four classes of Javelin exosuits Anthem will launch with, including the Ranger, Colossus, Interceptor, and Storm. The Ranger is your all-rounder, while the Colossus is a heavy hitter – no details about the Interceptor and Storm were shared. Of course, you’ll be able to fully customize your Javelin suits, and some cosmetics can be purchased with real money, but the game won’t have loot boxes. EA and BioWare also provided some details about Anthem’s pre-order bonuses, and the Legion of Dawn Edition, which will set your back $80. 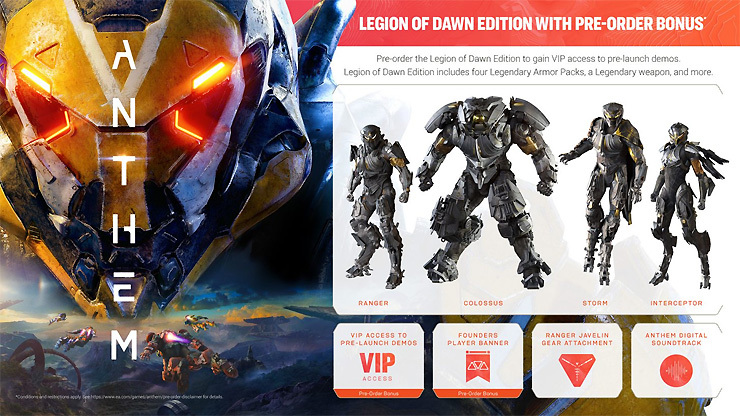 In addition, those who purchase the Legion of Dawn Edition of Anthem for pre-order or after launch will also receive the full set of Legion of Dawn Armor Packs (including the Ranger Javelin Legion of Dawn Armor Pack), a Ranger Javelin gear attachment, the digital soundtrack and more. Anthem boosts onto PC, Xbox One, and PS4 on February 22, 2019. Origin Access Premier members will be able to play the game a week early on February 15.